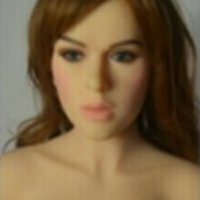 The YL-155 custom aka W155 (big hip) is a female love doll by YL Doll. The YL-155 custom has a body length of about 155 cm and weights ca. 30 kg / 66.14 lbs (manufacturer specs). Viola is a female head by YL Doll. It is made of TPE. Shael is a female head with pointy elf ears by YL Doll. It is made of TPE. Jennifer (Jinshan no. 30) is a female head by YL Doll. It is made of TPE. Vee (Jinsan no. 81) is a female head by YL Doll. The head is made of TPE and features closed eyes.